In my book, nothing beats a fresh, no-fuss salad for a quick lunch or dinner on a busy summer day. It's stress-free. It doesn't involve opening a hot oven on a hot day. It can be adapted to match anyone's tastes. Perfect! I first made this salad about two years ago...and now I'm kicking myself for not making again until now. Part potato salad-part veggie ensemble, it boasts both a complex variety of flavors and distinct textures. 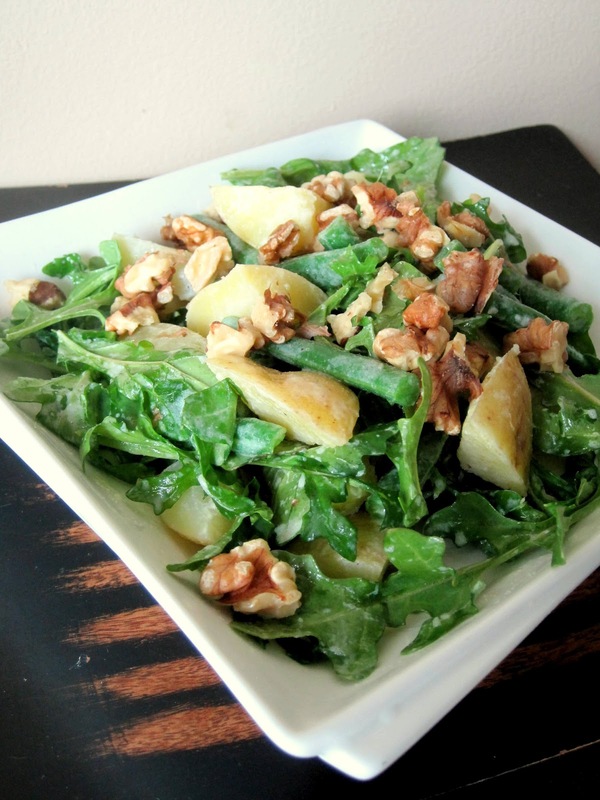 Combining crisp, blanched green beans, creamy potato bites, crunchy toasted walnuts, peppery arugula, and a tangy vinaigrette, it is anything but a boring salad. My only change to the original recipe was to use extra virgin olive oil in place of the walnut oil, since I had none on hand. Though I'm sure the dressing would be even lovelier with the walnut, I found it perfectly amazing regardless. Over medium-high heat, toast the walnuts in a dry pan until fragrant, being sure not to burn them. Remove from the heat and coarsely chop. Set aside. Prepare an ice-water bath in a large bowl and set aside. Return pan of water to a boil. Add green beans, and cook until tender and bright green, about 3 to 4 minutes. Using a slotted spoon, transfer the beans to the ice-water bath to stop the cooking. Drain. Whisk together vinegar, yogurt, mustard and 1/2 teaspoon salt in a small bowl; season with pepper. Add oil in a slow, steady stream, whisking until emulsified. Arrange arugula, potatoes, and green beans on a platter. Season with remaining 1/2 teaspoon salt and 1/4 teaspoon pepper. Drizzle with dressing and sprinkle with toasted walnuts. Toss to coat. You had me at arugula! looks delicious!